In the wake of the 2009 conference on “the eloquence of colour” organized by the French Society for Word and Image Studies (SAIT), this 2014 interdisciplinary symposium wishes to examine the unique position of gold across literature and the arts. Indeed gold is a pigment like no other. Its materiality inevitably conjures up a complex and paradoxical symbolism which typically negotiates tensions between the mythical and the political, the beautiful and the commercial, the sacred and the profane, the invisible and the tangible, the untarnishable and the ephemeral, virtue and lucre, the collective and the singular, the social and the private. “Gold in/and Art” therefore purports to continue the exploration of the dialogue between the arts inaugurated by previous SAIT conferences, while confronting such issues of artistic cross-fertilization with an analysis of the processes of valuing/devaluing/revaluing at work in literature and the arts. Gold will be envisaged under all its forms, as mineral, colour, light and/or value—whether it be financial, ethical, mystical, philosophical, or aesthetic value. The conference theme therefore lends itself to a multiplicity of approaches which may be economic, historical, political, cultural, artistic, philosophical, literary and/or linguistic. Taking as a point of departure Gérard-Georges Lemaire’s observation about gold’s omnipresence in the history of art and its renewed fascination among contemporary artists (see G.G. 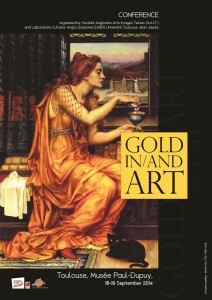 Lemaire, L’or dans l’art contemporain, Paris: Flammarion 2011; and exhibitions such as “Gold” in 2012 at the Belvedere in Vienna or “Going for Gold” in 2013 at the Seattle Art Museum), researchers are encouraged to examine works of art/literature or writings on art/literature which give gold pride of place, either because they foreground gold as their primary material or because they capitalize on myths and legends about gold. We are also interested in receiving proposals for papers studying the intersection between art and economics, building on the work of critics such as Jean-Joseph Goux (L’art et l’argent: la rupture moderniste 1860-1920; Frivolité de la valeur; Symbolic Economies; The Coiners of Language), Marc Shell (The Economy of Literature, Money; Language and Thought; Art & Money), Catherine Gallagher (The Body Economic), Mary Poovey (Genres of the Credit Economy) or Regenia Gagnier (Individualism, Decadence and Globalization; The Insatiability of Human Wants: Economics and Aesthetics in Market Society; Idylls of the Marketplace: Oscar Wilde and the Victorian Public). Finally, from a political, philosophical, epistemological, moral, religious or spiritual point of view, it may be helpful to keep in mind Zarathustra’s comments on gold : “Tell me, pray: how came gold to the highest value? Because it is uncommon, and unprofiting, and beaming, and soft in lustre; it always bestoweth itself. Only as image of the highest virtue came gold to the highest value. Goldlike, beameth the glance of the bestower. Gold-lustre maketh peace between moon and sun” (Nietzsche, Thus Spake Zarathustra, chapter XXII). Indeed, gold has traditionally been used as a standard—of purity, value, soundness or excellence. But how has this notion been either consolidated or challenged in art and literature? Do we post-moderns still believe in the universal and eternal prestige of gold understood as a benchmark of value? Or has the possibility for such a consensus disappeared with the emergence of more diversified centres of power?